Pasta salads are a great addition to any summer meal. So, if you are looking for the perfect side dish to share with the dads in your life this weekend, look no further. The Mediterranean Turkey Pasta Salad recipe I found on the Butterball app (available for iPhone and Android) is sure to be a big hit! 1. Whisk olive oil, vinegar, garlic and oregano in small bowl until well blended. 2. 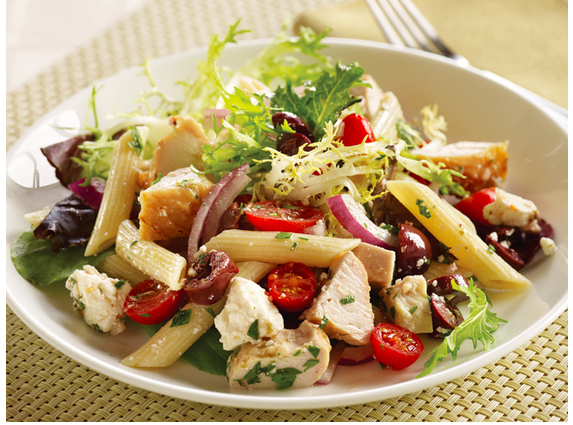 Combine turkey, pasta, olives, tomatoes, cheese, salad greens, parsley and red onions in large salad bowl. Gently toss with dressing. Refrigerate or serve at room temperature. As I mentioned, I found this recipe. as well as several other tasty dishes, on the Butterball app (available for iPhone and Android) – check it out for some great recipes to enhance your summer meals!